TORRES, Esteban Edward, a Representative from California; born in Miami, Gila County, Ariz., January 27, 1930; graduated from James A. Garfield High School, East Los Angeles, Calif., 1949; attended, East Los Angeles College, East Los Angeles, Calif., 1959; attended, California State University, Los Angeles, Calif.,1963; attended, University of Maryland, College Park, Md., 1965; attended, American University, Washington, D.C., 1966; United States Army, sergeant, first class, 1949-1953; United Auto Workers representative and international labor consultant, 1954-1968; community affairs organizer, 1968-1974; United Auto Worker official, 1975-1976; consultant, Office of Technology Assessment, 1976-1977; United States Ambassador to the United Nations Educational, Scientific and Cultural Organization (UNESCO), Paris, France, 1977-1979; special assistant to the President, The White House, 1979-1981; delegate, California State Democratic conventions, 1968-1983; delegate, Democratic National Conventions, 1984, 1988, 1992, and 1995; unsuccessful candidate for election to the Ninety-fourth Congress in 1974; elected as a Democrat to the Ninety-eighth and seven succeeding Congresses (January 3, 1983-January 3, 1999); was not a candidate for reelection to the One Hundred Sixth Congress in 1998; member, California state transportation commission, 1999 to present. 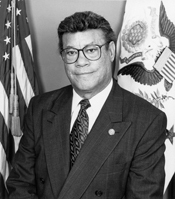 Esteban Edward Torres in Hispanic Americans in Congress, 1822-2012. Prepared under the direction of the Committee on House Administration by the Office of the Historian and the Office of the Clerk, U.S. House of Representatives. Washington: Government Printing Office, 2013.